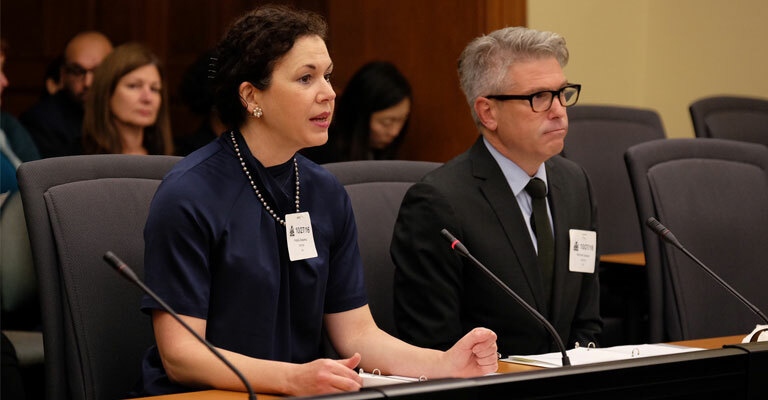 Council Chair Angela De Palma, OCT, and College CEO and Registrar Michael Salvatori, OCT, addressed the provincial government’s Standing Committee on Finance and Economic Affairs today to support and voice cautions about proposed legislation affecting the College’s disciplinary process. The committee received public and institutional briefs regarding Bill 37, the Protecting Students Act. In thanking the government for moving forward on the legislation, the College Council recommended a series of important amendments to the Bill. Among its concerns, Council called for greater transparency in posting Discipline Committee decisions on its website while continuing to respect the privacy of College members’ medical information. “We’d like to start by saying that professional misconduct in Ontario is rare,” Council Chair Angela De Palma said. “There are 243,000 Ontario Certified Teachers and in any given year fewer than 20 lose their licences to teach. The attention teacher misconduct receives is significantly out of proportion to the ongoing examples lived by our members every day in this province. “The vast majority are exemplary professionals who demonstrate the high ethical and practice standards expected of Ontario educators. Every day they care for children, oversee their safety and nurture their growth and achievement. See the full College brief and presentation remarks. It is anticipated that the legislation will come into effect later this fall.